This is the foundation of the 3BG System. We lay down the groundwork for everything you need to know to live a healthy and fit lifestyle while still enjoying an ice-cold beer. Too busy to read. Got it covered. Fire the Mp3 Audio Book onto your iPod or burn it on a CD for the car ride to work. 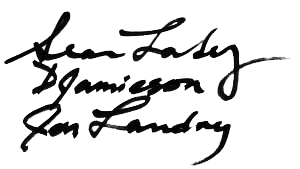 All the amazing content from the Lifestyle Manual has been recorded for easy listening. Whether you’ve never worked out before or you’re an expert in the gym, the 6 quick and easy to follow exercise videos outline the different phases of the 3BG System. Seeing Drew perform all the exercises in sequence makes it easy to implement the awesome workouts into your routine. Throw them on an iPod or keep them at home on your computer for a quick reference on what to do each day. Never worked out before? Got a question about how to perform certain exercises? Not a problem. We’ve put together an encyclopedia that shows and explains how to do all the exercises in the system. With this reference guide by your side, it’s like having you’re own personal trainer showing you what to do. No gym membership? Don’t like the going to the gym? Got it covered. With the @ Home Workout Guide you never have to step foot in the gym again. 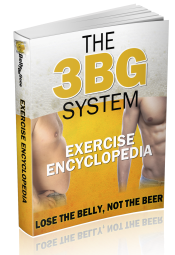 This easy to follow exercise guide for when life gets too hectic and you can’t make it to the gym is designed to match the principles of the 3BG in gym System. It requires basic exercise equipment that most people already have in the basement and is guaranteed to get you the results you want. We’re busy guys, and you are too. That’s the reason we went a step further and give you the ‘Coles notes version’ of the 3BG System. 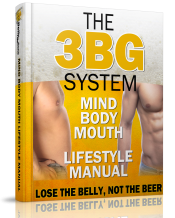 We trimmed down the Lifestyle Manual like the System will trim down your beer gut. Do not go another day without reading this essential Quick Start Guide. We’ve given you every resource and strategy proven to lose fat, gain muscle and energize your life faster than you ever thought possible. The goal is to lose the beer belly and feel good about yourself in order to dominate other areas of your life. The 3BG System delivers this and more. And the best part of it all is once you order you get immediate access to the 3BG System by downloading it from the web in minutes. That means you can start using the principles from the 3BG System today! We’ve decided to make mom and dad proud and practice the good morals and values that they instilled in us and we our standing by our product and offering you a 60-day money back guarantee. So go ahead and purchase the entire 3BG System now. And if after following the system for 8 full weeks you aren’t satisfied with whatever the results you’ve made, let us know and we’ll issue you a refund. No questions, no arguments and no changing our minds. The risk is on us- you honestly try the program, learn and implement the tools that are outlined in the System and if you aren’t happy with your new and improved physique, simply email us and we will gladly refund your hard earned cash. 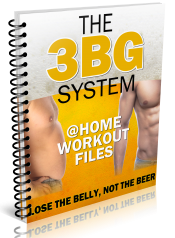 Grab your copy of The 3BG System Today! PS – Remember if you are not satisfied with the 3BG System, you can ask for your money back as part of our 60 day money back guarantee. But we’re positive you won’t- and not just because you’re too lazy to get the refund. We stand by the 3BG System and give you a full 60 days to test-drive it. That’s how confident we are that you’ll achieve amazing results while adopting the 3BG lifestyle and mentality. PPS – You get the entire 3BG System for the small one time payment of $47. That’s a little more than a case of beer but significantly less than a night on the town with the boys. Just think of it as an investment in yourself that will pay back in everything you do from this day forward. 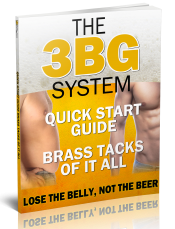 By acting now and adopting the 3BG System you won’t feel guilty the next time you stop by the store and pick up a case of beer. *Required Legal Disclaimer: Due to recent laws from the FTC, it is required that companies identify exactly what a “typical” result is. The truth is that most people never do anything with the products they buy, so most of the time, they get absolutely no results. In other words, if you want results you must take massive action. The people you see on this web site are examples of our best results and should not be considered “typical”. They followed a healthy lifestyle program that included proper nutrition, exercise, sleep and supplementation. They held themselves accountable and followed the System as written. If you want to lose the beer belly, you should do the same.